Pockets Full Of Pixels: MEDIEVAL ON CANCER!! Unmasking A Cure Relay For Life Team (#38) presents the Third Annual Medieval Faire, running from May 19 though June 18, 2017. 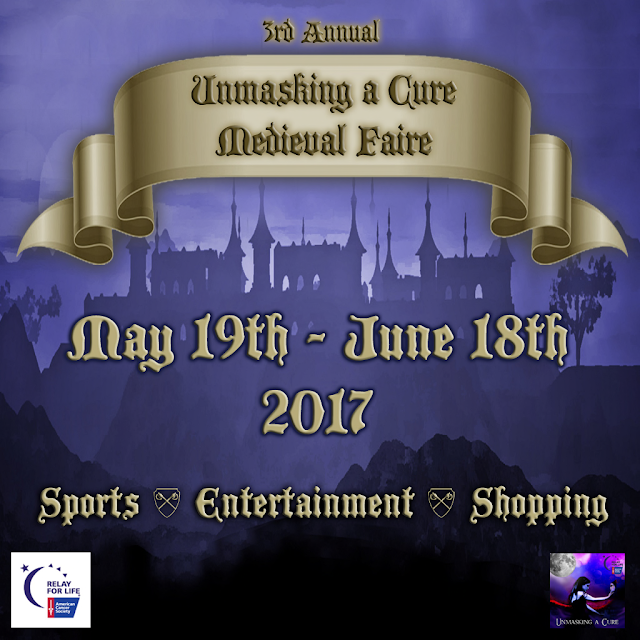 The Faire, similar to a real world "Ren Faire", offers medieval tournaments in jousting, sword play, archery, horse racing, chess, Slurbbage, all day Trivia. There are over 80 merchants throughout the Faire grounds; village, travelers' camp and Gotya garden. All of them supporting Relay For Life with items that will be sold for a 100% donation. On the entertainment front, we have ChangHigh Sisters, dozens of live performers and DJs are all donating their time and talents to Relay For Life. Don't miss this exciting month-long event; try your hand at all the sports, find that perfect outfit or decor item, or enjoy live musicians and dj sets! Awesome job and I love the name of your blog!